Here's another shot of the Rt. Hon. 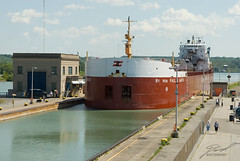 Paul J. Martin at Lock 3. The ship is built to the maximum size that locks will handle, so its a nice, tight fit.